The first time I ever heard about a Tesla Coil, was actually while playing the video game Red Alert during my teenage years. 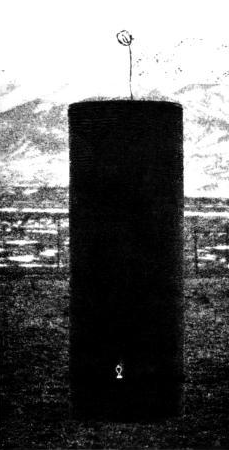 In the game, the coil was a powerful weapon which shot massive bolts of lightning at the enemy. Shooting big sparks is actually the main association people have with the Tesla Coil, since that is what modern “coilers” use it for. However, Nikola Tesla, it’s original inventor, had many practical uses for these high voltage, high frequency coils besides shooting sparks, and it actually came in many shapes and forms, all with their own characteristics and use cases. 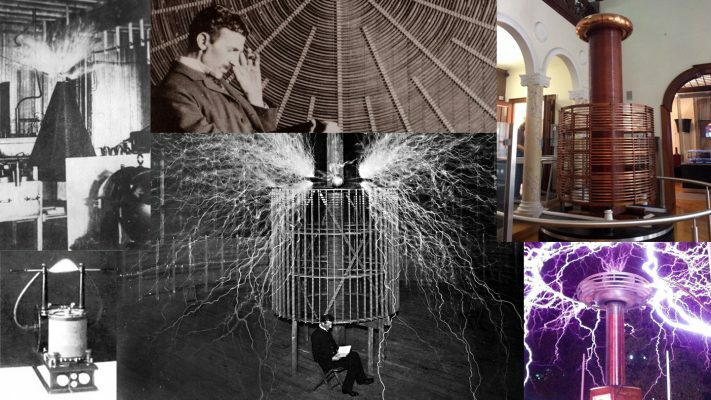 This article shows how the Tesla Coil evolved over time, and what it was used for. In 1887, Heinrich Hertz created the first experimental proof of the electromagnetic waves predicted by Maxwell’s theory. This created a lot of buzz around high frequency currents and sparked Tesla’s curiosity as well, who had up till then mainly been working on his AC motors and transmission system, as is evident from his patent history. Today we are used to hearing “gigahertz” being thrown around, which is equal to 1 BILLION oscillations per second, while in Tesla’s time 20 to 30 THOUSAND oscillations was considered a very high frequency. The reason is that we have transistors now, which switch on an atomic scale, while bulky mechanical oscillators were used in the late 1800’s, and there was just no good way to make them run much faster. So how did Tesla achieve this impressive feat? In other words, Tesla found practical use for Lord Kelvin’s condenser discharge – who he regularly credited 3 – and patented it. Tesla now had a way to create high frequency currents. 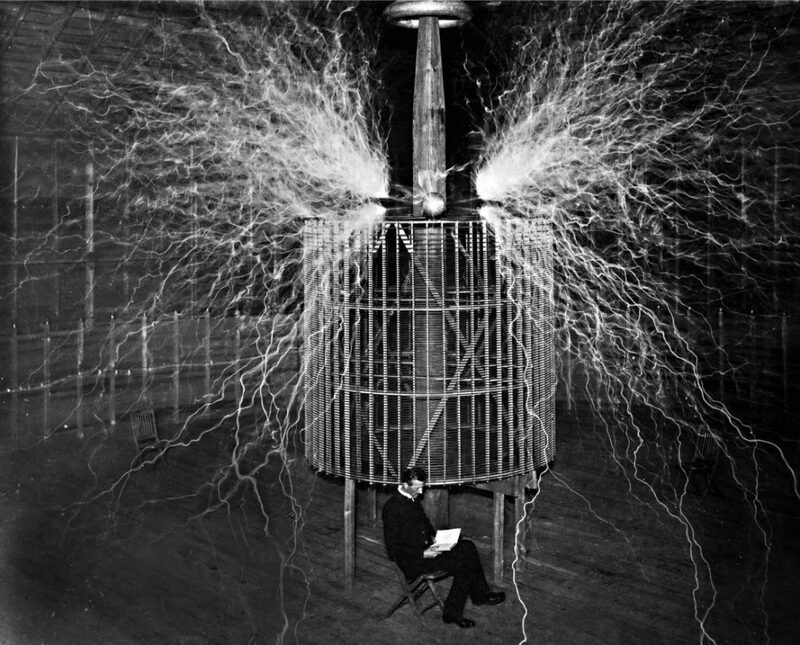 So the very first Tesla Coil ever was used to produce light using not just high frequency currents, not just high voltage currents, but both high frequency and high voltage at the same time! 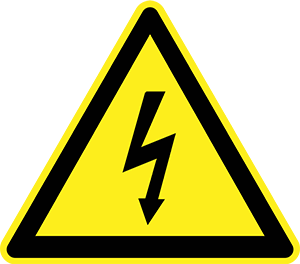 The Tesla Coil essentially expands the high frequency circuit mentioned earlier with a high voltage step up transformer to achieve “enormous frequency and excessively high potential”. 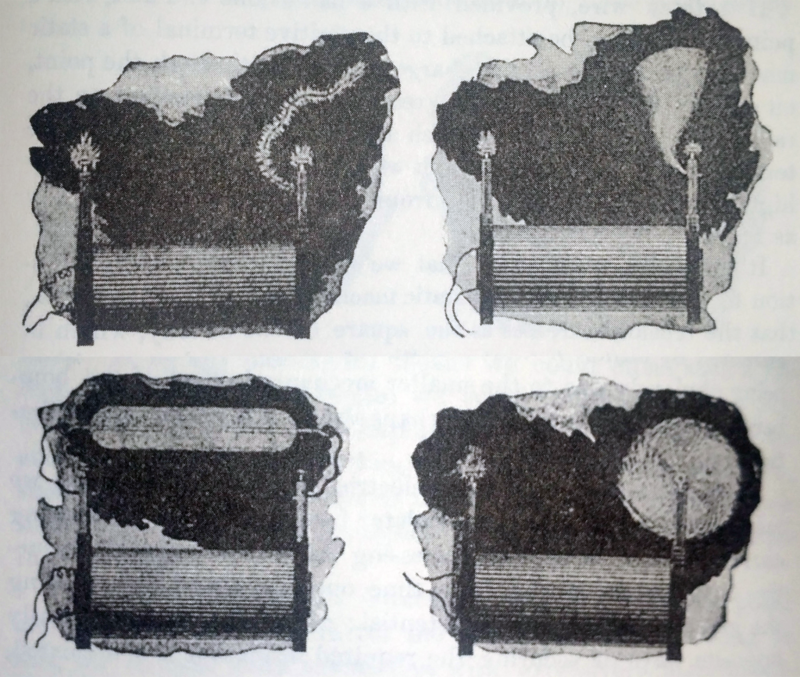 The diagram in the patent shows two bulbs connected by a single wire (the other end of the coil connected to a conducting wall), and Tesla even shows two custom single wire bulbs which he used in these lighting experiments. All very interesting stuff, and no mention of large sparks yet! So what did this first coil look like? And did it have other uses besides lighting? 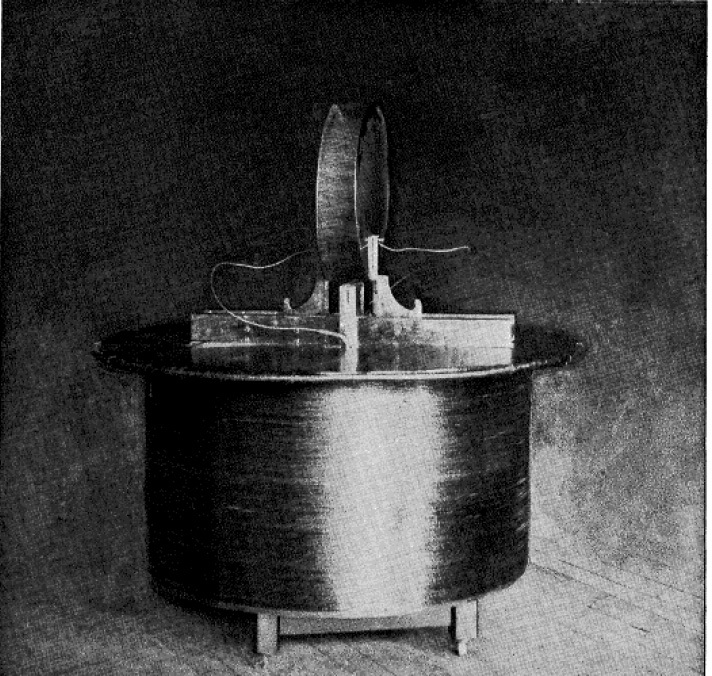 The first drawing of a Tesla Coil are found in Tesla’s 1891 lecture before the American Institute of Electrical Engineers, in which various experiments are shown utilizing the coil, including an extensive study of “discharge phenomena”, or sparks. Something that stands out immediately is that this coil is placed horizontally, not vertically like “modern” Tesla Coils. Also, there is no “terminal capacitance” on one end, and a ground connection on the other, like you usually see in a Tesla Coil. This setup is what is now known as a “Bipolar” Tesla Coil. It is interesting to read that Tesla did not have any math at hand to calculate the ideal primary length and capacitance, he simply said that “the length of the primary should be determined by experiment.”11 Also, no mention of resonance between the primary and secondary is mentioned in the lecture, so it seems like Tesla’s 1891 coil was still a tightly coupled, “normal” induction coil. 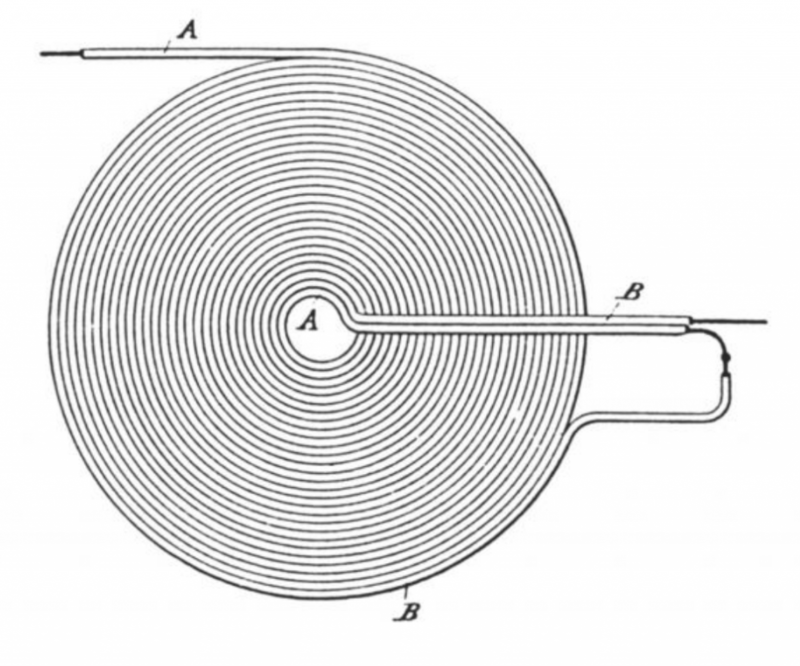 Now, was this bipolar coil used often, or only during the 1891 lecture? 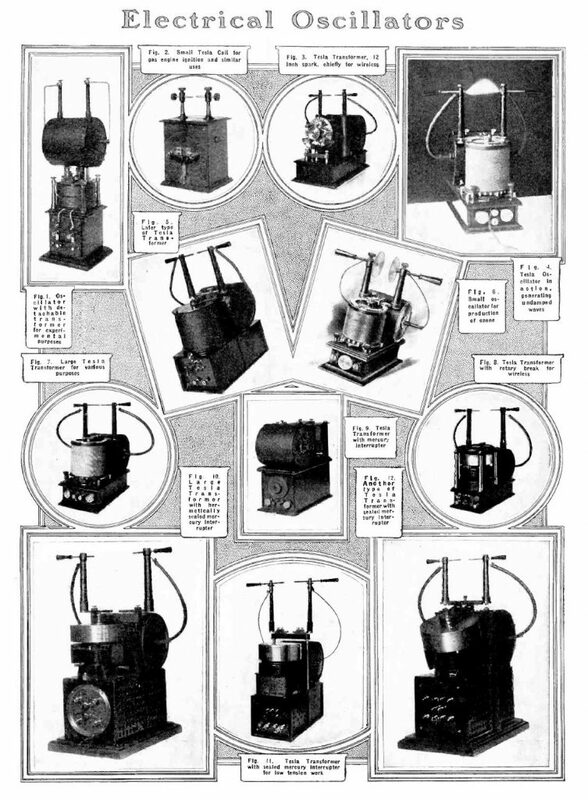 Well, years later, in an article in the Electrical Experimenter of July 1919, Tesla shared a whole range of bipolar coils and the things he used them for. It is clear from the picture above that Tesla used this type of coil extensively, and came up with all sorts of ingenious improvement. Further, it is funny to note that Tesla sometimes calls this device a “Tesla Coil”, and other times a “Tesla Transformer” or even a “Tesla Oscillator”. After reading all this info, I wondered how big these coils actually were, since size is hard to gauge from the pictures and drawings above. 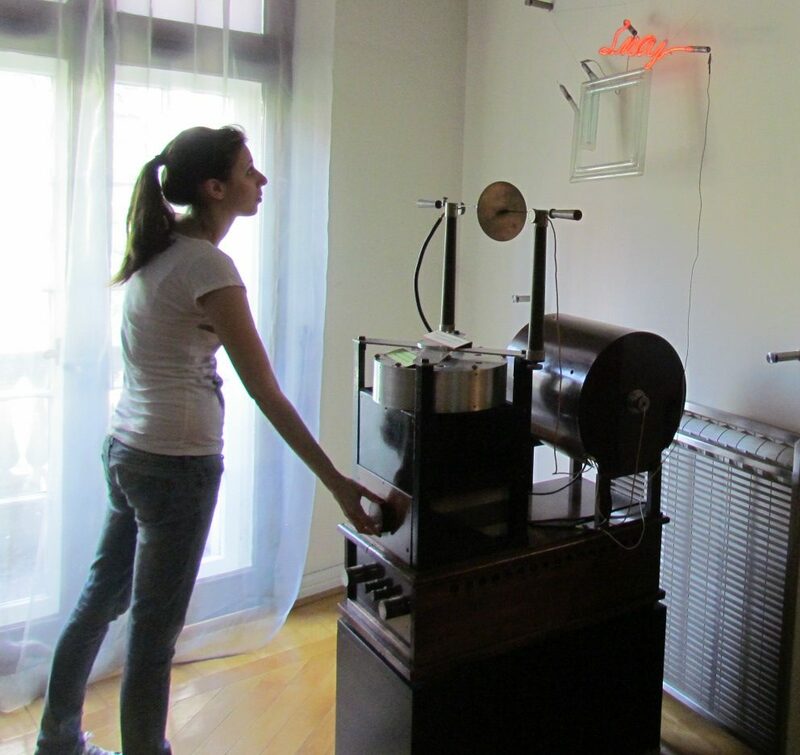 Luckily I found an image of an original coil displayed in the Tesla museum in Belgrade, powering an original Tesla light tube, and which has someone standing next to it, providing a good estimate of the size. After the 1891 lecture, Tesla gave several other lectures on high frequency, high voltage devices, and in 1893 Tesla got involved in developing the world’s first hydroelectric power plant at Niagara Falls, together with George Westinghouse. We see that during that period Tesla filed for several generator, motor, and power transmission patents. 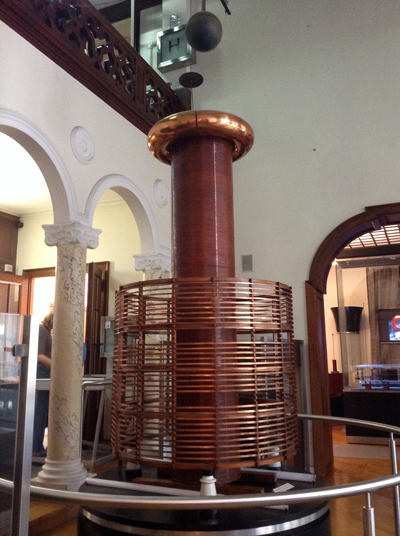 However, on the side he kept developing his coil, resulting in the massive conical Tesla Coil shown below. The cone shape was chosen to minimize the potential difference between the turns near the top of the coil, so there was less risk of damaging the insulation of the wires. In his comment, Tesla references two of his most famous wireless energy transmission patents, saying that he first used a conical geometry, and later a spiral one, but that in essence they were one and the same device. 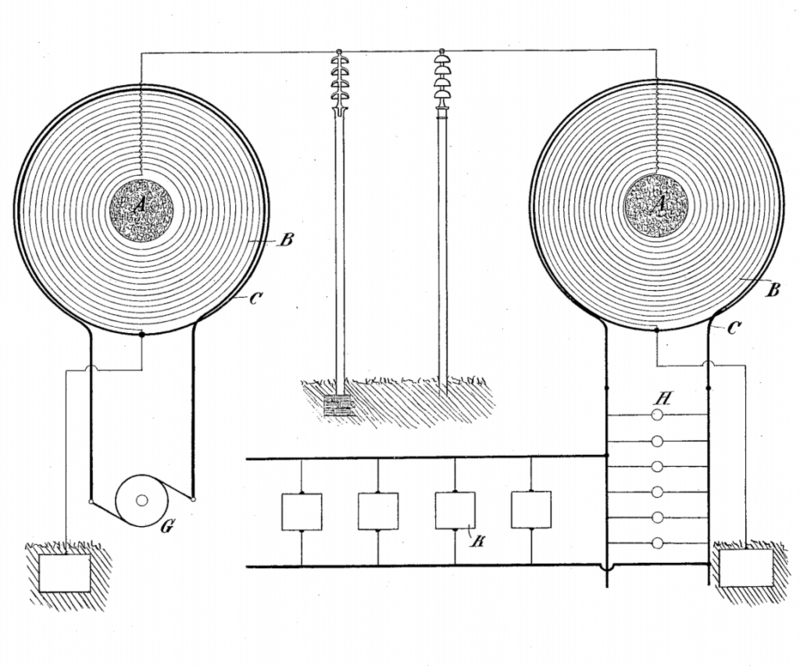 According to Tesla’s words, this coil was the first of his coils to implement a loose coupling between the primary and the secondary, and the reason for this was to allow the secondary to vibrate more freely without being weighed down by the primary, thus allowing for much greater voltages at the top of the coil, resulting in beautiful discharges. 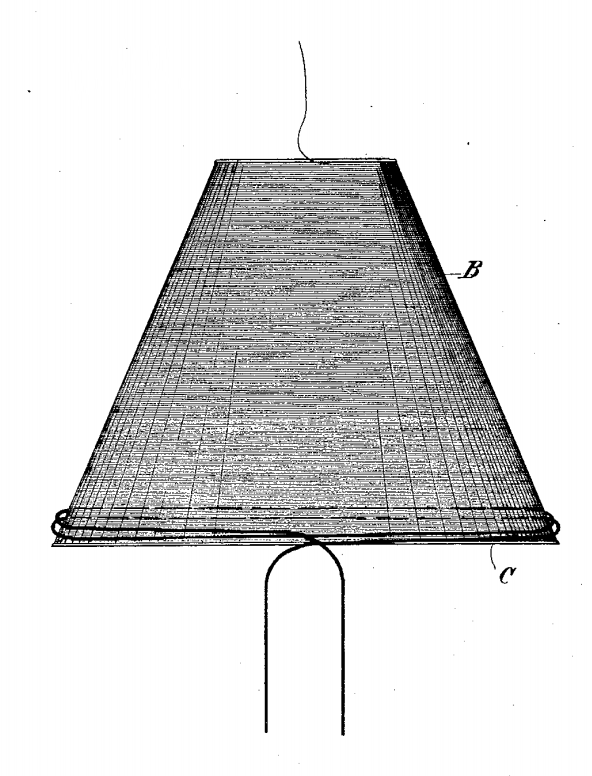 We encounter this conical coil once more in an 1897 “Electrical Transformer” patent. In another drawing from the same patent, it becomes clear how Tesla intended to use these coils to transmit energy at extremely high voltages over a single wire, stepping it up at the transmission end, and stepping it down at the receiver end to power loads. In this drawing we also see that a magnetic core A is still part of the design. 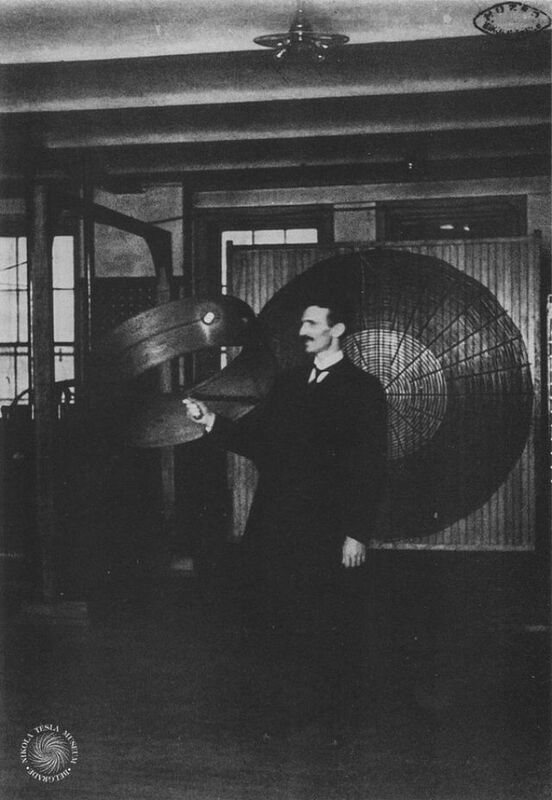 So Tesla generally used a flat spiral coil, but said other geometries worked as well. 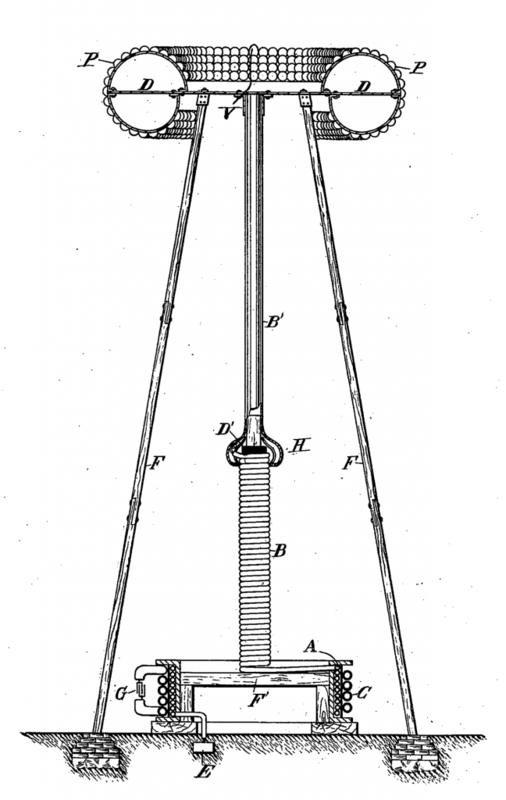 The “transmitting and receiving apparatus” referred to in the quote above are from two patents filed in 1897 for a revolutionary “wireless” energy transmission system, which planned to use the earth as a conductor. Here we see clearly that the Tesla Coil has officially evolved from a traditional, magnetically coupled transformer, into a resonant transformer, based on resonant inductive coupling. This is a crucial point in which Tesla Coils differ from regular transformers. It’s all about tuning the primary circuit to the secondary, and the receiver to the transmitter. However, Tesla kept using capacitors, mainly Leyden jars, in many of his later experiments. So even though the idea behind the bifilar coil is brilliant, it seems like Tesla did not find it useful enough in practise. It’s interesting that we’ve already discussed 3 different coil geometries, none of which resembles the “modern” helical Tesla Coil. So did Tesla himself even use this shape at all? Yes, he sure did, as you can see from the beautifully preserved original below, as displayed in the Tesla museum in Belgrade. 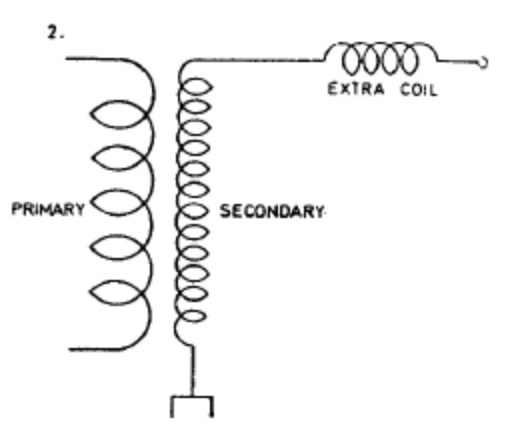 In the picture above we see the familiar thin helical coil shape with a toroid as terminal capacitance, as well as three 10-turn primaries, which could most likely be connected in series to vary the operating frequency of the coil. 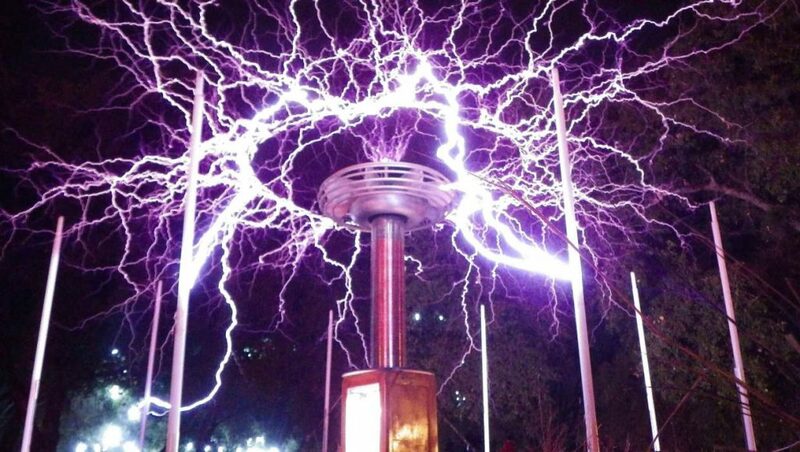 While this is the shape that first comes to mind for most people when they think of a Tesla Coil, Tesla did not actually write much or anything about this geometry in particular. 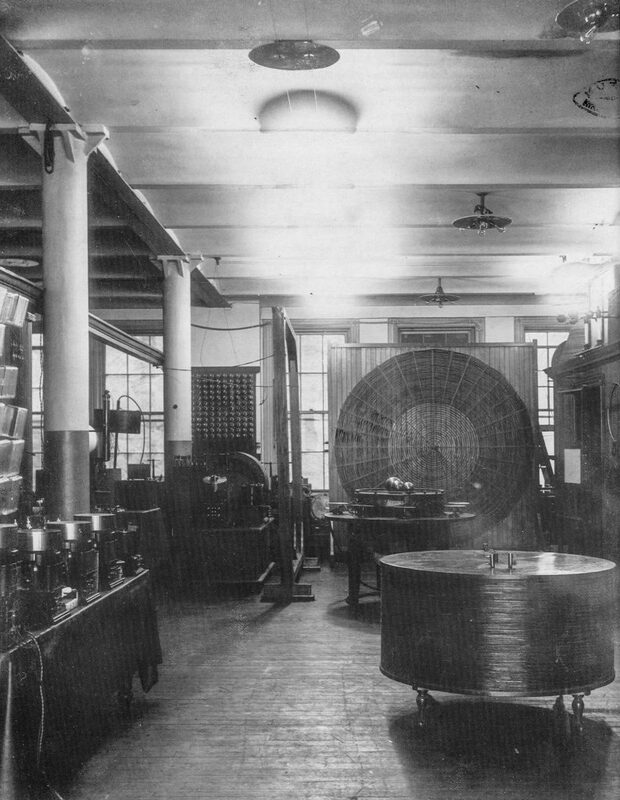 However, we do see this coil shape return on multiple occasions in pictures taken around 1899 inside Tesla’s Houston Street and Colorado Springs laboratories. These helical coils are sometimes wide and short instead of thin and tall. 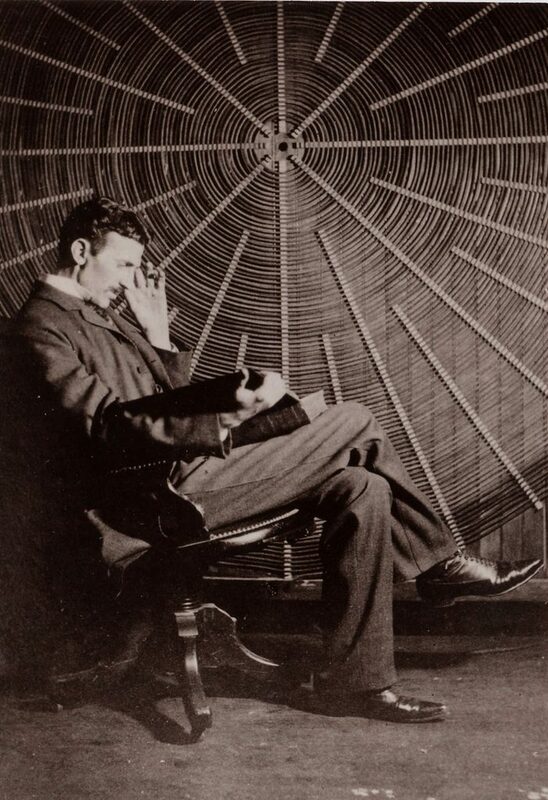 From the pictures above, and especially the Colorado Springs pictures, it seems like Tesla used a wide selection of helical receiver coils for experimentation purposes. Many of them even come without a primary and terminal capacitance, which suggests that this was not the “final form”, but merely a simple-to-put-together version of a coil used for testing purposes. We also see that the Houston Street coils were wide and short, while the Colorado Springs coils were of the thin and tall variety. 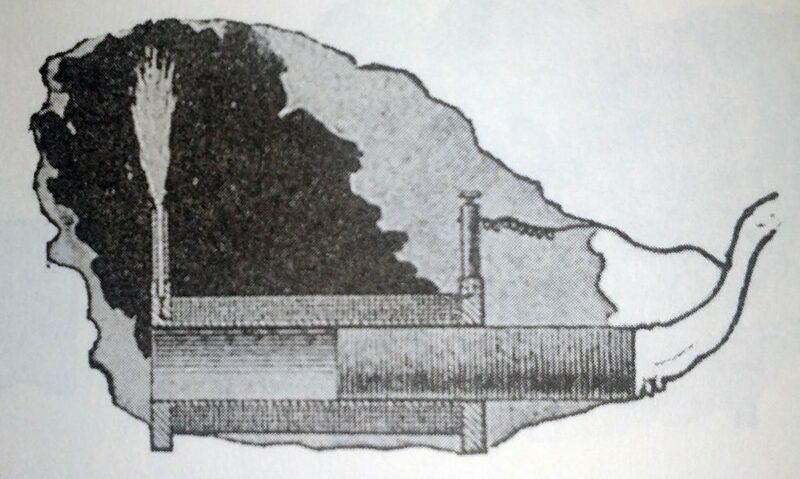 “It is a resonant transformer with a secondary in which the parts, charged to a high potential, are of considerable area and arranged in space along ideal enveloping surfaces of very large radii of curvature, and at proper distances from one another thereby insuring a small electric surface density everywhere so that no leak can occur even if the conductor is bare. … this wireless transmitter is one in which the Hertz-wave radiation is an entirely negligible quantity as compared with the whole energy, under which condition the damping factor is extremely small and an enormous charge is stored in the elevated capacity. Such a circuit may then be excited with impulses of any kind, even of low frequency and it will yield sinusoidal and continuous oscillations like those of an alternator. But was the only difference between a “regular” Tesla Coil and a Magnifying Transmitter the fact that the conductors were properly spaced? Not exactly. The biggest difference in fact is the addition of another coil into the circuit. 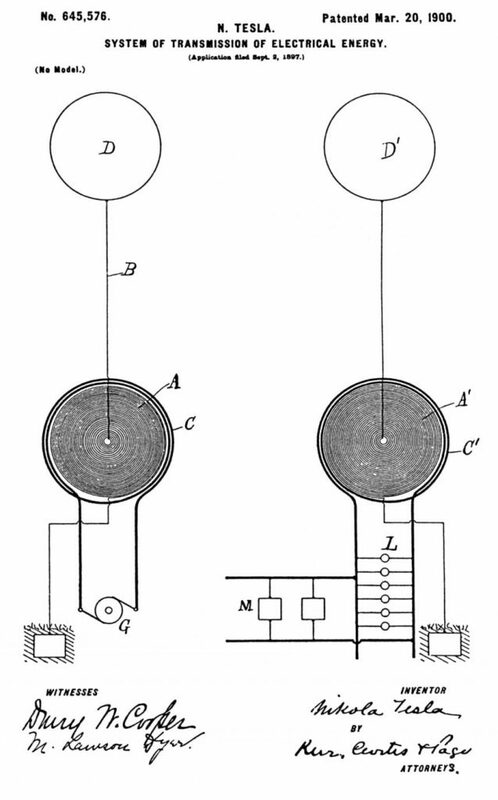 Whereas a Tesla Coil has a primary and a secondary coil, the Magnifying Transmitter has a third, freely oscillating coil, which Tesla simply called the “extra coil” (B in the patent drawing above). “It is a notable observation that these “extra coils” with one of the terminals free, enable the obtainment of practically any e.m.f. the limits being so far remote, that I would not hesitate in undertaking to produce sparks of thousands of feet in length in this manner. So the extra coil is what allowed the TMT to reach such immense voltages, but how? The primary coil and secondary coil oscillate at an identical frequency and are therefore resonantly coupled. While this coupling is key to induce current from the primary into the secondary, it also weighs the oscillations down. It adds a certain damping factor, since the secondary coil is not 100% free to oscillate as it pleases. Tesla’s brilliant insight here was that he would have a resonantly coupled primary and secondary, but then add an extra coil which is not tuned to the same exact frequency and can therefore oscillate more freely, allowing the voltage to rise to even greater heights. Anyone who has ever experimented with Tesla Coils know how sensitive the circuit is. For example, if you put your hand close to the coil, the frequency immediately drops due to the extra capacitance your body adds to the circuit, without even touching it! So the lower the self-capacitance, the less the circuit is weighed down, and the higher the voltage rise that is attainable. 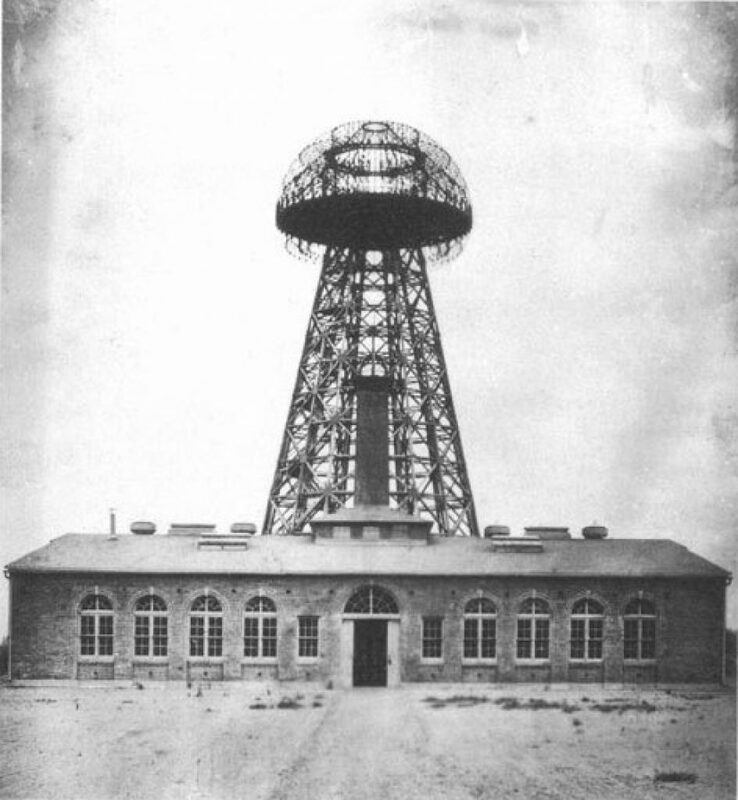 Once Tesla finished up his research in Colorado Spring, he started working on his first full-scale transmitting tower in Shoreham, New York, called the Wardenclyffe Tower. Construction was never completed, and only scattered notebook drawings remain, so we have no idea if Tesla’s groundbreaking wireless transmission system would have worked in practise. On top of that, Tesla’s energy was not “free”, as some claim. 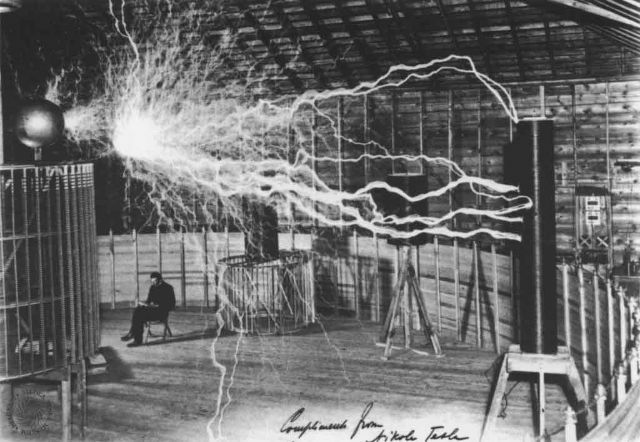 Tesla had to put in thousands of horsepower to kick his transmitter into motion, and even fried the power station near his Colorado lab once because he was using so much energy. However, his system being an open system, like a windmill or solar panel, rather than a traditional closed circuit, it is not impossible to conceive that energy already present in the earth or the ambient medium, which oscillated at the same frequency, could be resonantly coupled in to reinforce his input. Also, once an oscillating current was established in the earth, a lot less energy would be required to keep it going, just like how you need a lot of power to push someone on a swing, but once they are going you only have to give a tiny push to keep them swinging about. 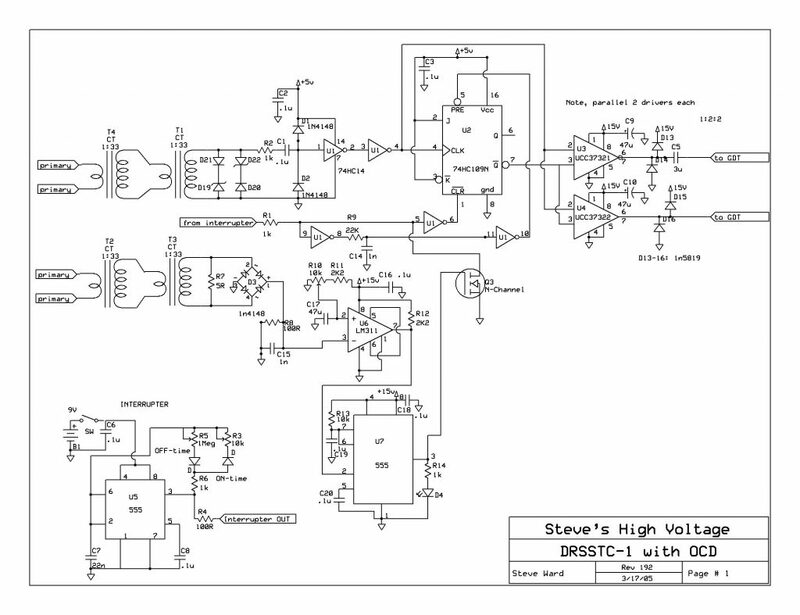 The TMT is a complex device and therefore harder to replicate than a Tesla Coil, which is why I was ecstatic to find a Colorado Spring Magnifying Transmitter Design Sheet, created by Simon from Tesla Scientific. There are designs for several operating frequencies, and you can even request a custom frequency design. Click here to check it out. After discussing the Magnifying Transmitter and its bold purpose to transmit power across the globe, it feels like a gigantic step backward to now talk about how modern “Coilers” apply some of Tesla’s ideas, simply to create big sparks and light fluorescent tubes in their hands. However, this is the current state of the Tesla Coil, and the reason why many people are unaware of the original grand purpose of these coils. On a positive note, thanks to the active coiling community, modern Tesla Coil calculators like TeslaMap have emerged, which make coil calculations a whole lot easier. These coils are almost exclusively helical coils with one terminal grounded and a toroidal terminal capacitance on the top end. 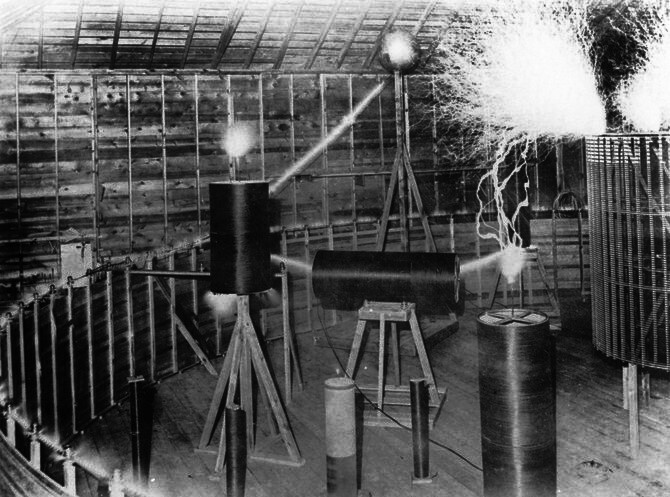 Another very interesting development is that today’s Tesla Coils are not always powered by spark gaps anymore, like in Tesla’s time, but often by electronics. Such coils are called Solid State Tesla Coils (SSTC), or Dual Resonant Solid State Tesla Coils (DRSSTC), and their circuit diagrams are mental, but work very well. The only thing I find funny is that the community’s general solution to creating larger sparks is to add more turns on the secondary and push more power through the circuit, while a much smaller coil, designed according to the Magnifying Transmitter specifications, would result in way larger discharges. The goal of this article was to clear up some of the confusion surrounding the use cases for these high frequency, high voltage coils, as well as to show the various stages of development they went through and the different shapes they came in, as each of the geometries had their own pros and cons. Tesla himself called his Magnifying Transmitter his best invention, and solely based on that fact it is worth researching in more detail, which I plan to do in the future. I hope you enjoyed this little journey through time! In my next article I will dive deeper into the various electrical transmission systems Tesla devised over his lifetime.